If you live in Brighton and Hove you cannot have failed to notice the recent invasion of Snowdogs at the Seaside, a unique public art trail running across the city until 27th November. These large sculptures, individually decorated by different artists, have each been sponsored by a local business. They are based on the children’s classic The Snowman™ and The Snowdog, written by Raymond Briggs who used to live in Ditchling. Want to see the Snowdogs? For those ex-MyBHers who will not see them, or those who cannot follow the trail, we are publishing photos of The Snowdogs in their locations, with details of the sponsors and the artist. And now the Snowdogs have been joined by their younger and smaller relatives, the Snowpups. 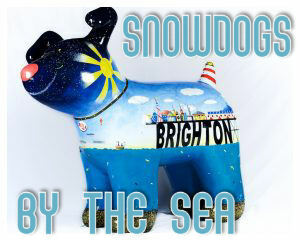 To see the Snowdogs by the Sea photographs, please click here. While The Snowdogs trail, which encompasses a wide variety of locations in the city, and includes a Snowdog at London Victoria station, is a fun project for all, there is a very serious side. Snowdogs by the Sea will be raising vital funds for the Martlets Hospice which provides end of life care for local people. If you would like to donate to the Martlets Hospice you can text SDOG16 to 70070. You can find out about events and activities on the Snowdogs by the Sea trail by visiting their website here.